Martial Arts Classes in, Doncaster, Rotherham, Thorne, Barnsley, Sheffield and Milton Keynes. 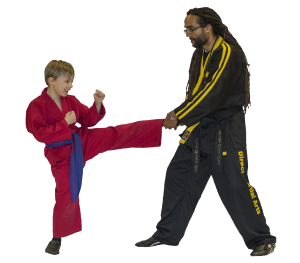 Our Children’s Martial Arts programme focuses on improving your child’s listening and motor skills. These skills will help them enter society with more confidence and enthusiasm. We work on the child’s ability to set goals and as we proceed in the programme we provide a very positive environment for him/her to achieve their goals. Goal setting works wonders with the child, as they will be able to focus on a goal and apply it to other areas of life. Our Unique Curriculum Combines Leading Martial Arts Styles with a Strong emphasis on Life Skills which will help to improve your child both physically and emotionally in ways parents desire most. Examples are: co-ordination, attention span, self-respect and proper discipline. Students also learn and practise such tenets as courtesy, self-control and perseverance while learning the foundation of a solid martial arts training programme. The best part of our programme is that it is FUN! // SELF CONTROL – Through martial arts your child will learn to follow rules and have the discipline to follow through. // IMPROVED FOCUS – Through martial arts your child will listen effectively and learn “zero in” on the task at hand and be unaffected by distractions! // SELF – CONFIDENCE – All types of challenges will be tackled more skilfully; your child will be free to pursue the many opportunities life has to offer, without fear! // BULLY DEFENCE – Your child will learn the skills it takes to stand up to that bully. // STRANGER DANGER – Your child will learn the valuable skills of stranger danger. We take them of the couch and teach them the importance of regular exercise. // SELF DEFENCE – We give your child the tools to protect themselves against a bully. » Does Martial Arts Make Kids Violent? » What are the most significant things martial arts taught me about life?